In medium size bowl whisk together flour, salt, baking soda, baking powder, and sugar. In a separate bowl beat egg and egg whites together, then pour into flour mixture along with oil and buttermilk. Mix together until blended well. Let dough set in refrigerator for 20 – 30 minutes, or overnight if you wish. When you are ready to bake, Preheat oven to 325* F.
In small bowl or glass measuring cup, scald milk, then and add cold water, and sugar to bowl. Mix with small plastic whisk and add yeast. Whisk again and let set for about 10 to 15 minutes in a warm place. Yeast should foam and start to rise. Remove dough from fridge and spoon into food processor or mixer, add yeast mixture, mix well on high speed until well blended and smooth. Spoon batter into a large pastry bag or 2 large frosting bags. The tip of the bag should be opened to about one inch across. I use the disposable frosting bags, and just snip the ends off till the opening is one inch wide. Grease nonstick donut pans thoroughly and squeeze batter into the circle filling each donut space. If you want to make jelly donuts, just over fill the space and completely cover the top of the donut hole with batter. Brush donut batter with melted butter and let them rise for 15-20 minutes in a warm place. Then bake for 22 to 25 minutes or until donuts have risen and completely brown. 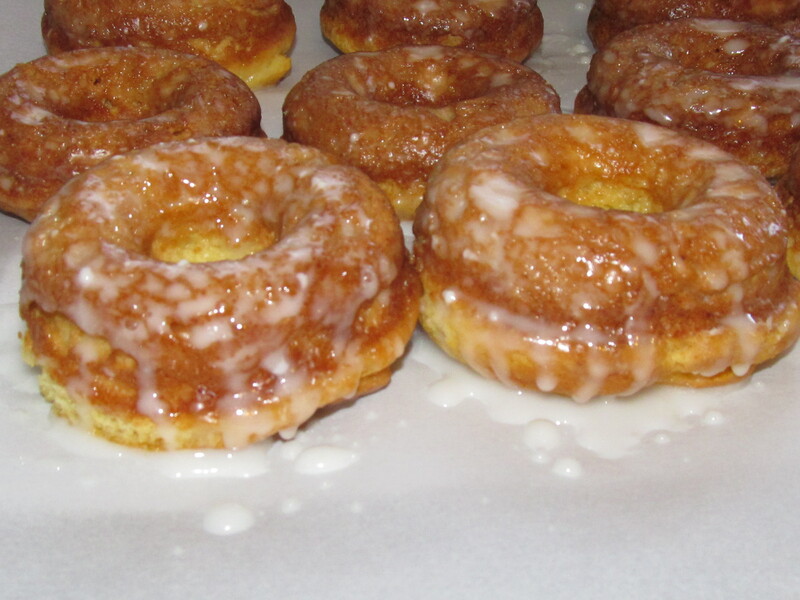 Remove from oven and brush donuts with melted butter again before removing from pans. Let cool for 10 – 15 minutes then remove from pans and turn them over and glaze while still warm. If you make jelly donuts, glaze using recipe below and then fill the holes with your favorite GF jelly. Store in airtight containers. Please note, if you use Betty Crocker GF alone or another flour that does not contain xanthan gum, you must add 1/4 teaspoon. This is enough batter to make 18 regular donuts, or 1 dozen jelly donuts. I use a very thin glaze, if you want a thicker glaze, just add more powdered sugar. Add ingredients to medium mixing bowl and whisk together until smooth. Spoon or brush over donuts, until completely covered. Yum! I have no had a donut in so long! These look yummy! Thank you Jessica! I just made them this morning & they are already gone. If you try the recipe let me know how you like them!